The Staff at Horse Power Healing Center, Inc.
President/ Founder - Linda Konichek Former teacher, textbook author, and entrepreneur, Linda Lee (Konichek) has loved poetry, horses, and Wisconsin’s lifestyle, since childhood. Twenty-five years ago, she and her family moved to a 114 acre farm southwest of Milwaukee, in Eagle, where she and her daughter breed Morab horses (a cross between the Morgan and Arabian horse). Her favorite job is working with the foals and young horses. She enjoys the ever-changing seasons and daily miracles of farm life, and has written two books of poetry that celebrate life in the Midwest. She also writes most of the promotional materials for the farm and the Morab breed, as well as monthly articles for the WISCONSIN HORSEMEN’S NEWS. Horse Power Healing Center will be located at Jericho Creek Farm, and Linda has agreed to be President of the Board of this new program. Linda has been an important contributor on several Boards over the past twenty-five years. Her first Board experience was from 1981 to 1984, as owner of Linda’s House of Crafts, she served on one of the largest boards in the country, then called MACHA, the Mid-America Craft and Hobby Association. This Board, along with Offinger Management Company, helped plan one of the largest trade shows in the United States, held annually at the Merchandise Mart in Chicago, and helped promote MACHA to manufacturers, distributors and retailers. Linda was a member of the Consumer Show Committee, Membership Committee, Trade Show Committee, and Chairperson of the Education Committee. Linda also directs and produces an All Breed Open Pleasure Horse Show at the Jefferson Fairgrounds, Jefferson, Wisconsin, each year in August, which showcases the Morab, Morgan and Arabian horse and usually has over one-hundred entries. A portion of the show’s proceeds are donated to, Horse Power Healing Center. Director: Jodi Johnson has been in management for twenty years. She has managed restaurants; retail clothing stores and is currently an assistant manager at a pet supply store. Jodi is new to the horse world but has firsthand knowledge of the therapy that horses have to offer on a mental level, as she has received much help in relaxation and stress therapy from the beginning of her experiences with horses. Her ability to work with the public, as well as organize and motivate employees will make her an incredible asset to Horse Power Healing Center. I would like to be able to help people with special needs and challenges receive the enjoyment and incredible horse healing power that I have personally received since I have begun my journey with horses. I want to watch as people begin their journey from the first pat on the neck, to the first time they sit on a horse and then when they get to walk around the arena on the back of the horse. I cannot wait to hear the comment from that parent that says “my child smiled for the first time in a long time today after riding” or for a parent to tell us that their child is now able to possibly sit up on their own from lessons learned in balancing on the horse. My vision may seem simple to those reading this, but I have had an incredible journey through life and I want to offer something back to those that do not have the ability to help themselves. Horses can be the beginning of a long road to recovery for many people and I want to be part of it. 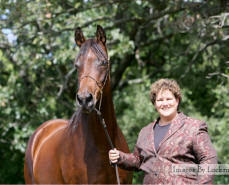 Beginning at age twelve with 4-H clinics and shows, Wendy has over twenty-five years experience in riding, training and showing all breeds of horses. She is well-known nationally for her skilled work handling and showing her own stallions, as well as those belonging to clients. 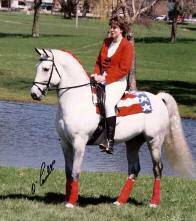 Her show ring presence includes many Championships in Class A , Dressage and Open show high points. In the past ten years, she has worked teaching many adults and young people her winning ways. She is especially good at empowering beginner students and encouraging them to be independent in handling, riding and showing their horses. Through Jericho Creek Farm II, Wendy has been raising quality Morabs, Morgans and Arabians since 1985. 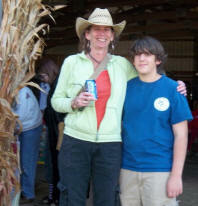 She holds Equine Breeding certificates from Ohio University and Equine Reproduction Organization. In the past twenty-five years, Wendy and her mother, Linda, have successfully bred and delivered over eighty foals. In 1987, at age sixteen, she was active in founding the International Morab Breeders’ Association and has served that organization ever since, in many capacities, notably as a member of the Board for over twenty years, newsletter editor, Youth Director, Webmaster and co-director of Region 4 IMBA shows and activities. Her first experience with therapeutic riding came just after high school graduation, when she started working with a friend’s adopted children, who had special needs. They attended a Smiles show, using Wendy’s first Morab mare, Ta-ket, “Taco”, the foundation mare of Jericho Creek Farms, and Taco’s daughter, Jericho’s Magic Lady, “Cha-heeta”, and won several ribbons; they even appeared at the Midwest Horse Fair in the Morab demo before an audience of thousands. During this time, Wendy worked for Lutheran Social Services as a CNA, with many people who were mentally and physically challenged. 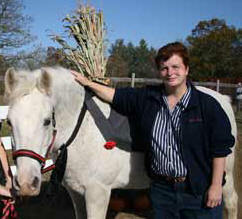 In recent years Wendy’s interest in therapeutic riding has grown, and she attended the 2006 Region 7 NARHA, (North American Riding for the Handicapped Association), in Illinois; continuing to learn, she completed three NARHA training sessions at Fieldstone Farms in Ohio, and attended the 2010 NARHA Conference in La Crosse, WI. 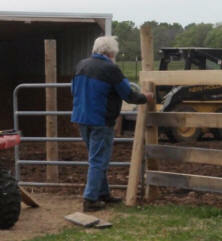 Norm fixing one of the many fences. Norm is Linda's husband and he gives both financial and physical support to the many projects on the farm. He is also called "Santa" by one of the HPHC students. He is also the one who cuts and bales the fifty-acre hay field, that helps to feed the many horses on the farm. 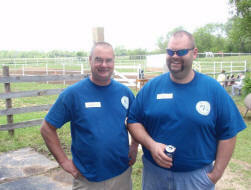 Larry and Jamie at the 2010 Open House. Jamie Grund is the boyfriend of Wendy Konichek and Larry Johnson is Jodi Olenski's boyfriend. They both give support to the program anywhere it is needed from building fences to side-walking. Alli with Jericho's Magic Lady. Copyright © 2016 Horse Power Healing Center, Inc.